After the successful release of an Owlboy Collector Edition for PS4 & Switch in August, SOEDESCO has announced that the indie RTS (Real-Time Strategy) game, 8-Bit Armies, by Petroglyph Games will be the next title to become a part of their limited edition line-up. The collectible will come packaged in a 14.4″ x 10″ gold embossed box. Inside will be the physical game, a soundtrack, manual, skull print bandana, flag, three 8-bit style pins, an army style patch, 12 postage stamps (featuring characters from the game), a DIY papercraft tank, and a wearable, metal dog tag. The 8-Bit Armies: Limited Edition will be available for PC, PlayStation 4, and Xbox One. Only 6,000 will be produced for each console. 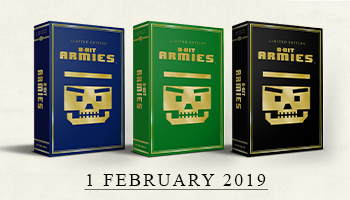 The collectible is expected to hit store shelves on February 1st, 2019. Pre-orders are currently available for the PS4 & XB1 on the GameStop website and for all 3 iterations on Amazon. 8-Bit Armies is currently purchasable digitally for PC, PS4, and XB1. Its predecessor, 8-Bit Invaders! is available on Steam. The 3rd title in the Petroglyph Games 8-Bit, RTS series, 8-Bit Hordes, is also available on Steam. It will be released digitally on PlayStation 4 & Xbox One on February 1st. A physical edition for the PS4 will also launch that day. Read more about the 8-Bit series & other titles from Petroglyph Games on the developer’s website.